Knowledge: Keishi pearls are formed when the mollusk ejects the pearl bead nucleus but continues to make a pearl. The pearl size is refered to its longer length range(e.g. 6-8mm). Keishi pearls sometimes are also called "cornflake pearls" because of the unusual shapes. 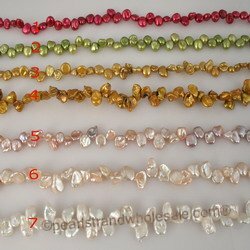 You may find these same pearls described with a variety of spellings, too, such as "Keshi","Kashi" or "Keishe".